Starter kit to customize drawer organization and resolve clutter in minutes. Dimensions: BaseMat: 20" x 14"; Short Divitz: 1.5" x 1"; Triangles: 0.72" x 0.72"
Bought a few od these drawer organizers. They are wonderful. So nice to have everything in its place and organized. Trim it for size works well. I absolutely love this product! 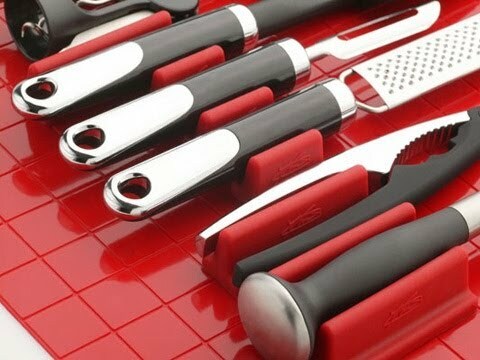 Has kept my knives very organized and easy to keep organized! May buy another for another drawer. The drawer organizer is absolutely wonderful. It is very versatile and I love the colors. Definitely worth the money. 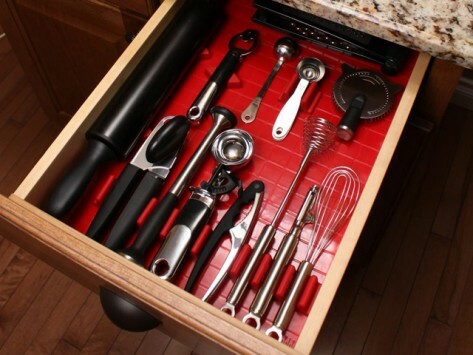 Do you have a scary kitchen drawer? One where you’ve been stabbed by a bamboo skewer, strafed by a can opener and pierced by a corkscrew? Now you can put your mind at ease and straighten out that mess with an easy, customizable organizer. The creator is entrepreneur Keith Nielson, who refused to let clutter take over his drawers, craft and tool areas. His solution is DrawerDecor, a DIY system of modular sheets and dividers that can be trimmed and repositioned to fit your drawers, toolboxes and desktops. Each 16-piece set comes with one nonslip BaseMat made from food-grade silicone. There’s also an assortment of Divitz dividers, which stick to the BaseMat so you can create perfectly sized storage slots for even your most irregularly sized tools and utensils. Decked out in red, green, blue, orange, or purple, your work area will look and feel like it’s had a mini face-lift. You, too, can conquer clutter and put an end to junk drawer mayhem.